No report but we do have some photos. Leader Brenda Walker, 19 miles, 3000ft of ascent, 21 walkers & 2 dogs. The pre-walk warning that parking was limited at the start point was obviously heeded as everyone turned up early for the walk. The forecast was good for the day but it was a chilly morning and we were glad to get underway. Brenda, our leader for the day, took us from the start down some steep steps to the valley below and after a group photo we followed the valley past Hardcastle Crags to Gibson Mill. Here we said goodbye to Brenda's husband who had taken photos and her dog Ruby who was too young to do the full walk, however, her other dog, Paige, continued with the group. We continued to New Bridge and then headed north, taking a quick break at Lumb Hole waterfall. The weather was warming up nicely as we made our way north east past Leeshaw Reservoir and through Penistone Country Park to our lunch stop, the town of Haworth. The weather was warm and sunny and the town busy with tourists. After lunch we headed out of town along the Brontë Way to Brontë Bridge. Picking up the Pennine Way, we climbed up to Withins Heights for a quick stop before dropping down to Walshaw Dean Middle Resevoir. Following the path along the eastern edge of the resevoir we headed south and then dropped into the valley we started off from. Brenda then invited us to her house which is situated near to the start for tea and home made scones along with various jams and cream : perfect end to the walk as we sat in her garden in the sun with superb views to the north. Nice to see some familiar faces who we have not seen for some time. Also our thanks to Brenda for a superb walk, and to her and her husband for their great hospitality. Walkers: 19, Weather: Dry and Sunny. After meeting at Devils Bridge Kirkby Lonsdale,a short coach journey took us to the Village of Wray to start today’s walk at 9.35. Our first objective was the village of Wennington,and after a break at the village green alongside the River Wenning, our journey continued,passing Wennington Hall School (built in the 14th century) to arrive at the Hamlet of Wrayton,before a short section of road walking to reach Cantsfield, to pick-up a good bridleway that took us to the delightful church of St John the Baptist just outside Tunstall and our lunch stop. Feeling refreshed we continued over undulating countryside to cross the busy A65 road near Hipping Hall Hotel.the walk passed through the village of Leek and continued alongside Leek Beck to reach Cowan Bridge (it was at a school here that Emily, Charlotte,Maria and Elizabeth Bronte attended) Elizabeth died at the school due to experiencing harsh privations. The last few miles took us through Casterton Village,alongside a golf course,through a caravan park before arriving back at Devils Bridge at 3.40pm. A bit of a mix-up at the outset over the start time (which will be corrected for Stage 2) but pretty soon we were off on Stage 1 of the 100 mile walk led at the front by Geoff “Mo Farah” Holburt! We enjoyed good walking weather all day, or rather everyone else did – I dropped out with a knee injury at Belmont!!! “I really enjoyed the walk. For me this leg of the hundred is not too hard and gets the first 23 miles done without too much stress on the body. There are a lot of stiles to negotiate, and care needs to be taken on some of them where the step down is not where you think it should be. Also, in wet conditions some of the big slabs will be very slippery. The route description seemed to work fine and there are posts to look for to get across pastures where the path may not be too obvious. Shouldn't be too much of a problem on the day with hundreds of people etching their way in front !! And so the pilgrimage draws to a close. 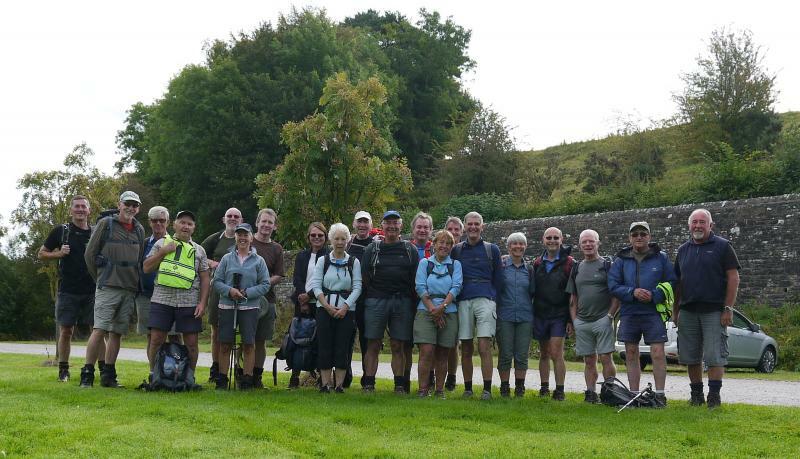 15 walkers gathered at the earlier time of 9am to complete this part of the Monastic Way. The forecast was bad but apart from two showers it was T shirt weather all day. Leaving Whalley Abbey it was under the Arch and Viaduct and along a track to pick up a path that circuited the outside of the now defunct Calderstones hospital. This eventually joined the Ribble Way which was to be followed all the way to Sawley. Morning break was at Edisford Bridge with seating and toilets; then on along the river passing Waddow Hall, through the small sculpture park, past the ugly cement works and across the river at Chatburn. Here the Ribble Way leaves the bank and climbs up to the road, past the big secondary school and down into Sawley. Lunch was taken in the Abbey ruins and this completed the Lancashire Monastic Way. It did not complete the days walking though. Climbing to Downham we past the closed post office to find that there is now a small tea room further on selling ice creams, very nice they were too! John left the walk here for an early return to the pub in Whalley. Leaving Downham we walked over to Worsaw whistling down the wind as we went to join the road leading to the outskirts of Worston. There was a brief encounter with Janice from West Lancs. We then picked up a track that led us past Mearley and Little Mearley Hall to Pendleton. Afternoon break was in this very pleasant hamlet, the pub there has won Camra Pub of the year 2014. Another time perhaps? There was now some tarmac bashing to reach Wiswell and we then followed a footpath through fields, woodland and a golf course to reach Spring Wood on the outskirts of Whalley. Dropping down the hill and back to the cars for 4.45pm. The Gps measured 20 miles, a longer distance for a Wednesday but a good walk. Thank you to all who supported us on the Lancashire Monastic Way. There is another part to the whole trail from Cockerham to Furness Abbey. We hope to complete this after the Red Rose 100. Hilary Scott and June Reeder. PS. One of our ambitions was to take Chris Langabeer on some paths he had not walked. We succeeded on at least 5 legs of the walk! Thank you also to Norman for helping with this last leg of the Monastic Way. The photos were taken on the recce of this walk.